I’ve been visiting the River Ehen now for three years and this is my 32nd post on this small Cumbrian river. You might think that, after about 40 visits to each of four locations, I should be beginning to understand the biology of the Ehen. I sometimes find myself being lulled into this false sense of complacency myself: I have a fairly good idea of where in each reach particular algae can be found, and when, in each year, they will be most abundant. It was no great surprise, last week, for example, when Maria finished measuring the biomass with her BenthoTorch and announced that it was higher than the measurements she made last month. We’ve seen this trend of a sharp increase in the quantities of algae at this time in previous years. Similarly, we were expecting (and therefore looked for) the pink blushes of the red alga Audouinella appearing on the rocks at the lowermost site. Again, these had been a common sight in the river during the cooler months throughout the period of our visits. Yet, in some other ways, the River Ehen has changed over the course of our visits. Most noticeably, the uppermost site, just below the outfall from Ennerdale Water, had some lush growths of the alga Nitella flexilis when we visited last week. I’ve recorded this from the Ehen before (see “Finding the missing link in plant evolution”) but not from this particular location, and not in such quantities. Growths of the submerged angiosperm Myriophyllum alterniflorum were also more conspicuous at this site than on previous occasions. 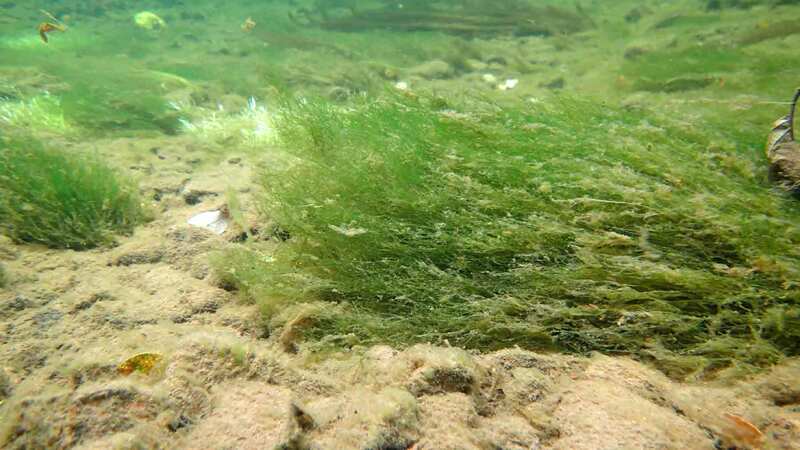 A few kilometres below the outfall, at the lowermost site that we visit routinely, I also noted that the mats of Phormidium autumnale, a cyanobacterium (blue-green alga) that is an ever-present at this site also seemed to be more conspicuous than on any of our previous visits. 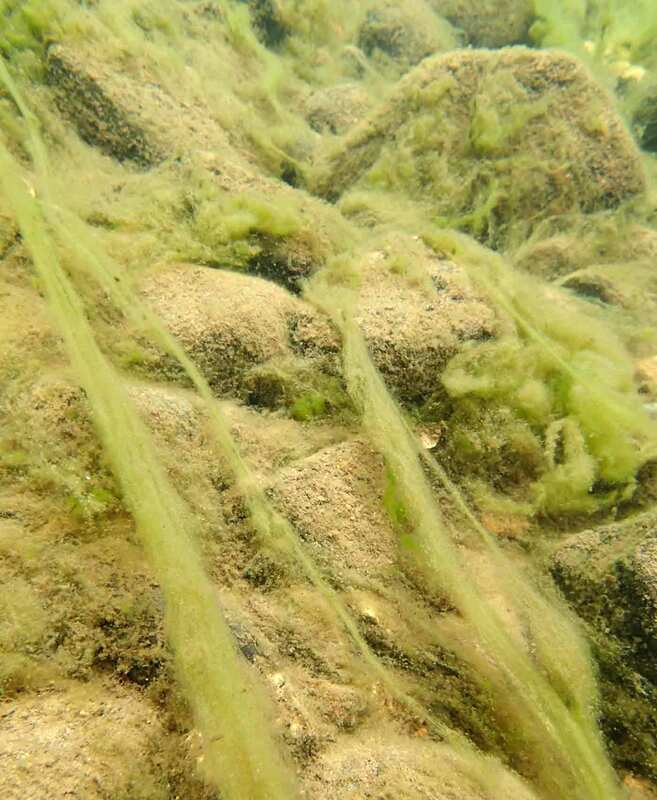 The mats of this alga were generally most obvious at the stream margins, where they were periodically exposed to air (see “In which the spirit of Jeremy Clarkson is evoked …”). However, last week, they were also prolific at some permanently submerged locations. Nitella flexilis growing in the River Ehen, about 400 metres downstream from the outfall from Ennerdale Water, October 2015. The clump is approximately 25 cm in length. Are these changes in the distribution of alga in the Ehen telling us something about how the river itself is changing or are they within the range of “natural variation”? My suspicion is that, even after three years close observation we have not seen every nuance of the river’s behaviour. Yet three years is a long time by the standards of many ecological studies. We also know that the river has changed over the period that we have been visiting. In particular, Ben Gill, a tributary stream that had been redirected to flow into Ennerdale Water in the 19th century, has recently been reconnected to the River Ehen. This should mean that the flow regime in the river is now more natural but we’ve noticed a lot more fine sediment in the river on occasions since this happened. The lake acts as a huge sediment trap so maybe this sediment itself is a ‘natural’ feature of the stream? There is a temptation to define ‘natural’ in terms of our own experience, which can make it hard to evaluate the significance of events that happened more than a lifetime ago. A mat of Phormidium autumnale on the bed of the River Ehen, about five kilometres from the outfall from Ennerdale Water. The scale bar indicates approximately one centimetre. Indeed, I would not even be writing about the Ehen today had I not been called in to look at the river due to the excessive growth of algae. This brings in another facet to the story: my colleague in this study, Ian Killeen, is an expert on the ecology and conservation of pearl mussels. He had seen enough rivers with healthy pearl mussel populations to know that the quantities of algae that he could see in the Ehen were unusual, and he then got in touch with me. We have to be aware, as applied ecologists, that we often do not start collecting data until someone perceives a problem. That, too, creates difficulties when trying to understand the ‘natural’ or ‘baseline’ condition of a river. These are not new themes for this blog. I’ve talked about the need for broadly-skilled, observant field-based biologists as the foundation for any effective environmental management process (see “Slow science and streamcraft”) and pointed out the limitations of pursuing highly-specialised tech-based approaches (see “Replaced by a robot?”). On the other hand, I am also realistic enough to recognise that the luxury of having a biologist look at the same stream on a monthly basis is way beyond the means of most regulators. So we need to find a compromise and, in the process, we need to agree on the non-negotiable elements of any compromise. Suffice it to say, ensuring that experienced biologists have enough time to visit the sites that they are expected to assess would have to be part of any package. However, don’t take that for granted: the line has, I am afraid, already been crossed by some environmental regulators. My most recent visit to the River Ehen stimulated me to continue my explorations of what the subaquatic microbial worlds would look like in close up. Before showing my latest creation, here’s a view of my working space which, as befits my positon in the no-man’s land between art and science, is neither a “laboratory” nor a “studio”. 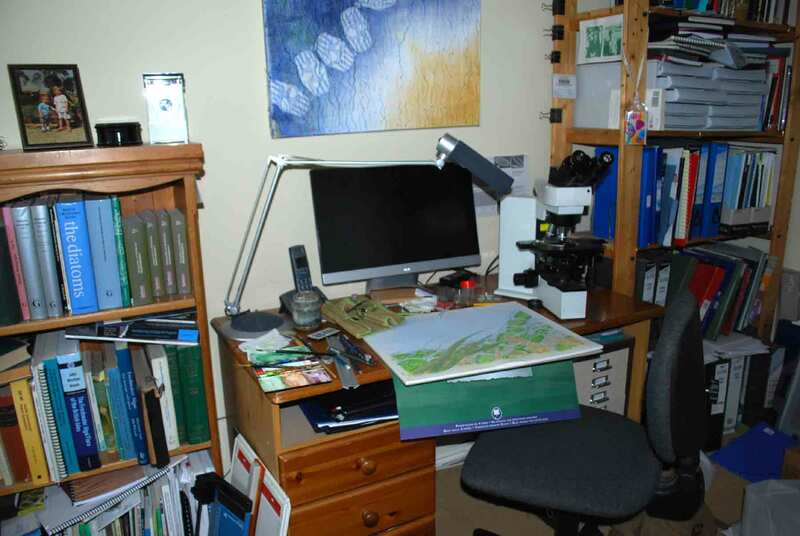 My microscope is on the right of the desk, with a monitor for displaying specimens at the back. To the left is the bookcase where I keep my identification guides, within easy reach. The desk has been cleared of clutter to make space for my watercolour pad, paints and pencils. The main attraction of my study for painting is the good natural light, which floods through the south-facing window. My study / studio / laboratory. I have usually worked out a rough design for a painting in a sketchbook before I have started, working both from direct observations down the microscope or photographs, with occasional dips into my books to check features or dimensions. I then build up the picture gradually, starting with the foreground, and then slotting the other organisms into the spaces around the individuals at the front of the picture. Working with watercolour and gouache means that I have bursts of activity, followed by pauses whilst a wash dries, then another burst. Or, to put it another way, I get on with real work (the stuff I get paid for doing) and take occasional breaks to add the next piece of detail to my picture. The one I have shown here has taken about five days from start to finish, with painting slotted around other activities. The finished picture is below. I’ve written much about the River Ehen over the past eighteen months or so and have been constantly surprised at how much variation we have seen in the algal communities over that time. Each time I visit, I pick up a stone covered in green algae from the stream bed but when I look at these apparently identical growths under the microscope, I se that several different species have appeared and disappeared over the course of the study. Back in winter 2013, these communities were dominated by Spirogyra (see “The River Ehen in February”); other times of the year, the most abundant alga has been Bulbochaete (see “The River Ehen in August”). Just a few kilometres downstream, we saw completely different algae again (see “At last a red alga that really is red …”). 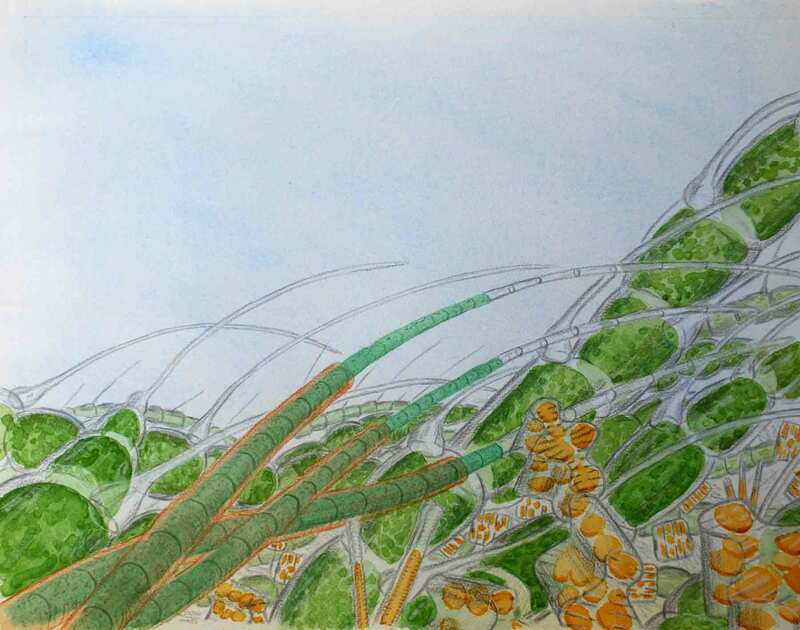 The structure of the communities when green algae predominated has, however, always been similar: the green filaments form a distinct layer over the top of a diatom-dominated understory. This is what I have tried to capture in this picture. 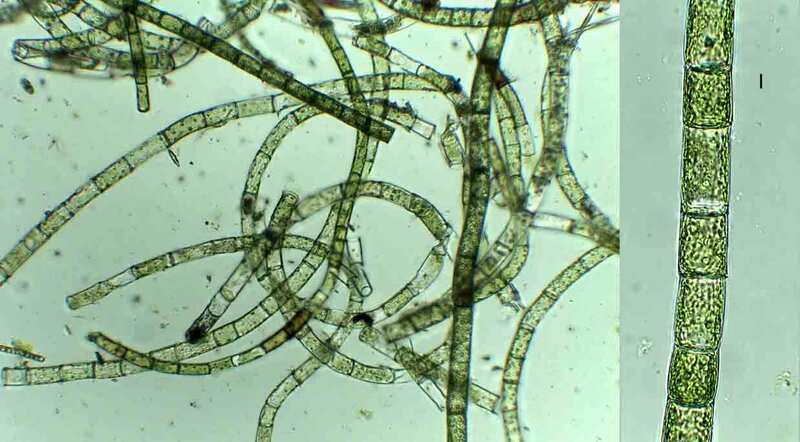 I have also added some filaments of the cyanobacterium Calothrix sp (see “Looking is not the same as seeing …”). The River Ehen in September 2014. The biofilm on stones has an understory of diatoms including Tabellaria flocculosa and Fragilaria tenera (right foreground) below a “canopy” of Bulbochaete. Other algae living in the biofilm include the cyanobacterium Calothrix (left foreground). 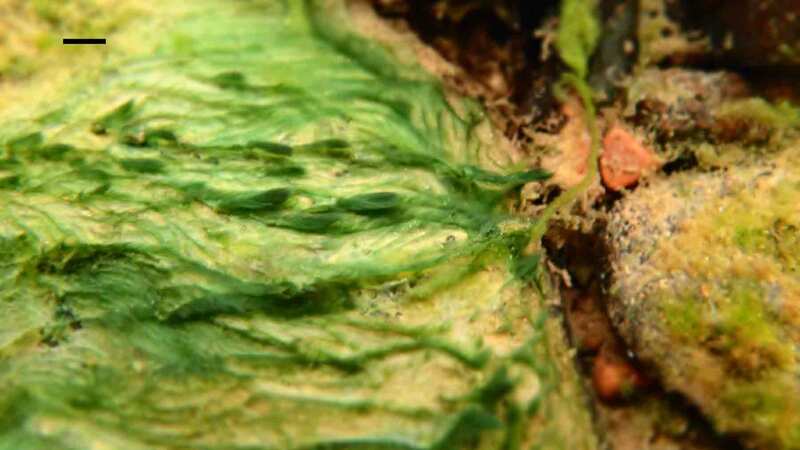 Both Calothrix and Bulbochaete have long hairs, which release enzymes to capture phosphorus bound to organic particles suspended in the water. The Bulbochaete filaments are about 10-15 micrometres (1/100th – `/67th of a millimetre) across. The presence of both Bulbochaete and Calothrix at the same location tells an interesting story. If you look back through my earlier posts, you’ll see that the long hairs characteristic of Bulbochaete and some other algae we’ve seen in the Ehen are thought to be adaptations that allow these species to thrive in situations where phosphorus is very scarce. But Calothrix also has the capacity to fix nitrogen, which is a useful adaptation when nitrogen is the scarcest nutrient. We know that nutrient levels in the River Ehen are low but the presence of both types of adaptation simultaneously suggests the organisms may be subject to both phosphorus and nitrogen limitation, perhaps reflecting short term oscillations in the relative availability of each over the year. We’ve now got heaps of data telling us what species of algae are present, and how much algae there are over the courseof a year. What we have done is akin to lifting up the bonnet of a car and naming all the parts of the engine. Our next task is to try to work out what all these different parts are doing (interpreting the role of hairs is part of this) and then, more importantly, to work out why the River Ehen’s engine doesn’t seem to be running as smoothly as we think it should. I’ll come back to this in a future post. I could not resist including this photograph of a pearl mussel grinning at my camera, partly because it reminded me of a paper I read a few months ago on the problems of conserving species such as pearl mussels which are not “charismatic”. Though pearl mussels lack characters, such as large eyes that make it easier for humans to empathise with them, there is, nonetheless, a layer of language used by conservation professionals which sits over the usual objective language of science when discussing the plight of mussels. This, the authors argue, helps us to think of species in human terms, even though they are “rhetorically challenged”. They point to one officer in a conservation body who referred to pearl mussels as “poor souls” who needed our help – the classic language of charity. And, indeed, there must be something about pearl mussels that raise them so much higher on the conservation agenda than most other invertebrates and way much higher than the lower plants which interest me the most. And, looking at this fellow leering at me from the bed of the River Ehen, I could see that they maybe had a point. Who would not want to conserve such an anthropomorphic little mollusc? I was thinking about my recent encounters with epiphytic algae (see “Cladophora and friends“) during my most recent visit to the River Ehen, when I noticed algae attached to some of the pearl mussels on the stream bed. We’ve seen this a few times before but today I had my Olympus TG2 camera at the ready and was able to take a few photographs. 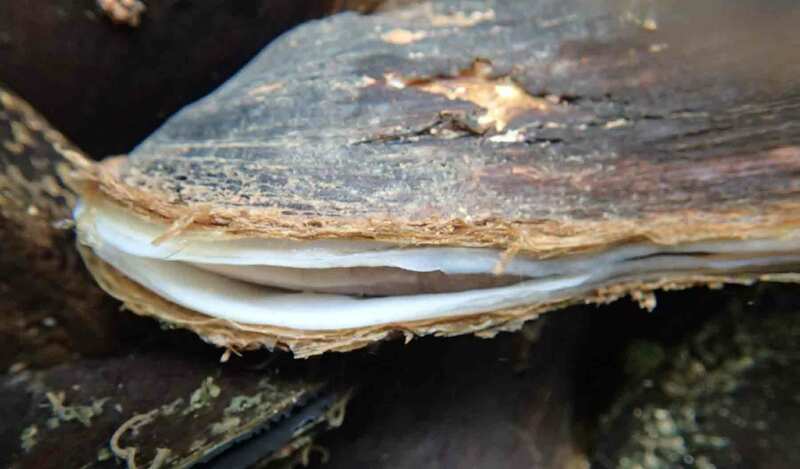 There have been occasions when the quantity of algae on the shells has been greater than this, and there has been concern about how this algae may affect the mussel’s ability to feed. It is one of several possible stresses on the pearl mussel population that we are investigating at the moment. When I put a small piece of algae that I removed from the mussel shell onto a slide and had a look at it through my microscope, I saw that it was Oedogonium, which we have already met in some posts from earlier this year (see “More about Oedogonium” and links therein). My guess is that this is not a sophisticated relationship between host and alga, but simply that the mussel shells represent a convenient and relatively stable substratum for opportunistic filamentous algae, which seem to thrive in the River Ehen at this time of year. 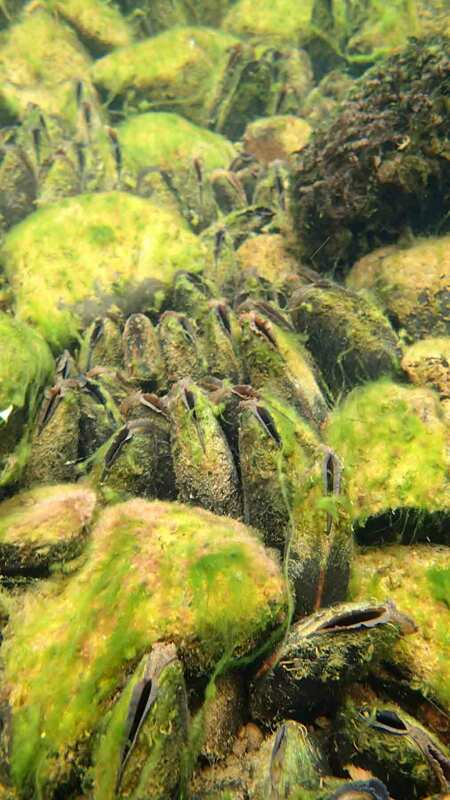 Pearl mussels (Margaritifera margaritifera) on the bed of the River Ehen, several with bright-green growths of Oedogonium attached to the shells. Note, too, the moss Fontinalis antiypretica in the upper part of the picture. The description of an alga growing on an animal shell makes a nice counterpoint to the recent posts on algae growing on other algae. There are other accounts of epizoic algae, though nowhere near as many as for epiphytic algae. This might simply mean that we have not looked in the right places. The most spectacular of the few records that I do know about comes from my Belgian friend, Luc Denys, who scraped the backs of beached whales and found two previously unknown genera of diatoms that seem to grow exclusively on this rather unusual habitat. Epizoic Oedogonium from the River Ehen, September 2014 at low (x100, left) and medium (x400, right) magnification. Scale bar: 10 micrometres (1/100th of a millimetre). Denys, L. (1997). 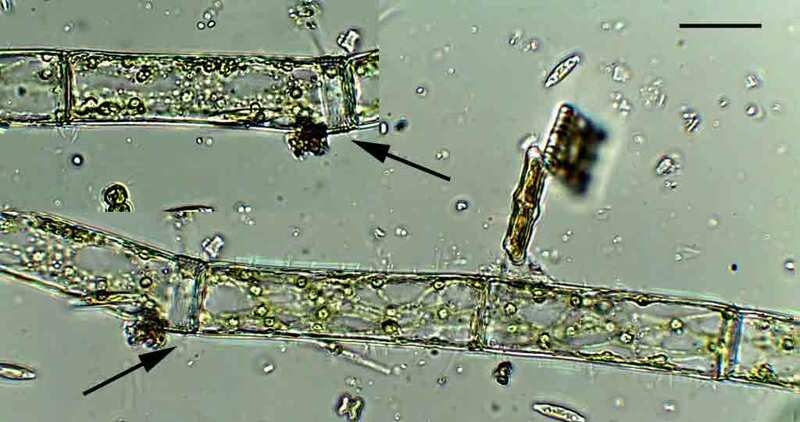 Morphology and taxonomy of epizoic diatoms (Epiphalaina and Tursiocola) on a sperm whale (Physeter macrocephalus) stranded on the coast of Belgium. Diatom Research 12: 1-18. Legendary wildlife cameraman Doug Allan appeared on BBC Radio 4’s Desert Island Discs this week and cheerfully described his first job after graduating, which involved diving in Scottish rivers in search of pearl mussels. Having already described food writer Nigel Slater’s brush with wildlife crime (see “Pearl mussels and porridge”), I would encourage you to go to the BBC website and listen to the programme if only because of Allan’s vivid description of harvesting and selling pearl mussels in the 1970s. Wildlife legislation was different then, so the word “crime” is clearly not appropriate. Attitudes have changed, too, though we’ve all heard that defence too often in the various trials associated with Operation Yewtree to feel comfortable. You’ll also have to listen to Doug Allan’s choice of eight records to take to a desert island. The man redeems himself by making Bruce Springsteen’s Thunder Road his first choice. Having written about a population of Oedogonium that I found in an enriched lowland stream a couple of weeks ago (see “The perplexing case of the celibate alga”), I arrived at the River Ehen last week to find much of the stream bed covered with a dense growth of filamentous green algae that, once again, turned out to be composed largely of Oedogonium. This soft water site differs in many ways from Stockerley Burn, but a species of Oedogonium seems to be thriving here too. Looking back at my notes, I see that I also found it at the same location this time last year. 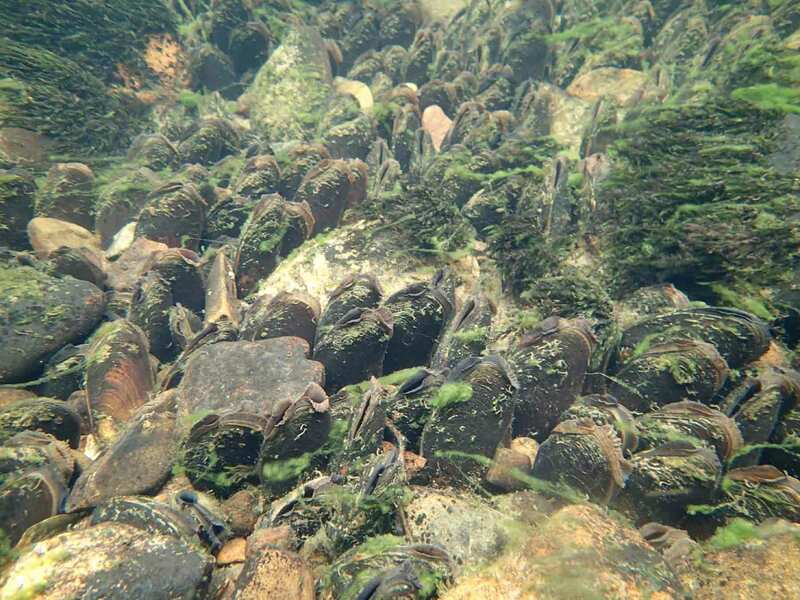 The quantities are such that colleagues are concerned for the health of the pearl mussels which also grow here (see “Pearl mussels in the River Ehen”). Wefts of filamentous algae (mostly Oedogonium) on the bed of the River Ehen, July 2014. Note, too, the flocculant material on the surfaces of the boulders. The photomicrographs of Oedogonium also show very nicely the reticulate (net-like) nature of the chloroplast. You can also see two cells of the diatom Tabellaria growing epiphytically on the lower filament. Photomicrographs of Oedogonium from the River Ehen, July 2014. Note the cap cells (arrowed) and the reticulate (net-like) chloroplasts. Scale bar: 25 micrometres (1/40th of a millimetre). We do not yet have a definitive explanation for the proliferation of Oedogonium in the River Ehen. The most likely explanation is that the river levels have been low for some time and this means that the gradual accumulation of algae proceeds without the sloughing that occurs when the river is in spate. The longer the algae can grow without disturbance, the higher the biomass. When there is a spate and stones are rolled over, the algae that were on top of the stone are deprived of light and gradually die and decompose. This means that the space between the stones of the substrate, through which oxygen-rich water flows to sustain the young pearl mussels becomes a fetid aquatic “compost heap” which will, in turn, extract this oxygen and make life for the young pearl mussels more difficult. As this is the last healthy pearl mussel population in England, my colleagues in conservation bodies are probably the only people in a region largely dependent on tourists to sustain its economy who are hoping for rain.